What is happening in the world of Speed Cameras? 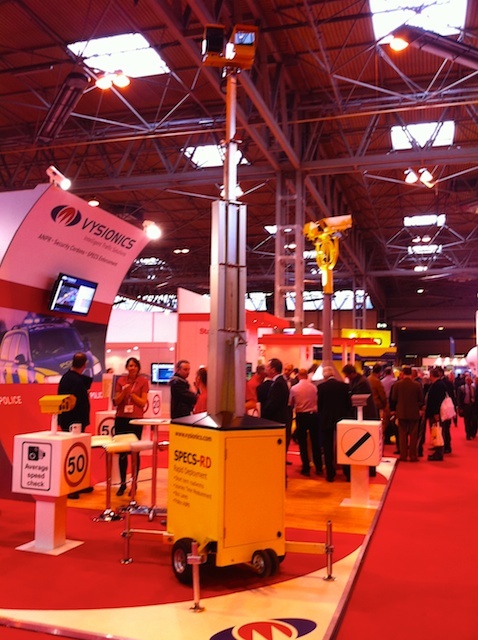 We quite often attend technology shows such as CES, and The Gadget Show, but last week we attended a completely different exhibition about roadside technology. Roadside technology covers a whole gamut of things from energy absorbing signs and barriers, through to traffic management, and of course Speed Cameras. The exhibition is actually an amalgamation of 3 separate, but related, events. There is Traffex, Parkex and Streetdesign, all with a focus on transport. I was interested in the Traffex and to a lesser extent Parkex as these are directly related to our interests. The main "takeaway" from the show was that Average Speed Cameras is the way to go, which of course we already knew. However this time there is competition in the marketplace. 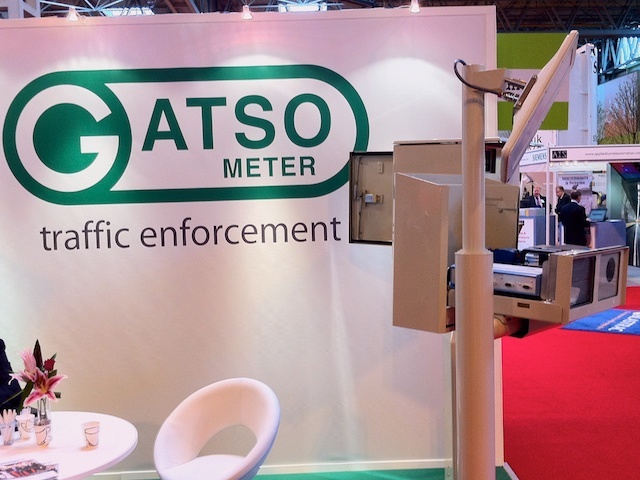 Last time we visited Traffex we interviewed Geoff Collins of Speed Check Services about the new SPECS3 networked average speed camera systems (click here for the report). At that time the SPECS3 were in the process of obtaining Home Office Approval (HOA) for implementation. At that time SCS were the only manufacturers of HOA average speed cameras. In the two years lots of changes have occurred in the industry and there are now (or will be shortly) three different Average Speed Camera companies competing for the business of the Safety Camera Partnerships. These are Vysionics, RedSpeed and Siemens. This article describes the various systems in operation. Siemens is the new kid on the block and SafeZone is currently awaiting HOA which is expected to be signed off in May or June. Seimens hit the news recently when there was a trial was conducted outside a school in Dorset. The system was originally installed on the A24 for the Home Office Type Approval testing. 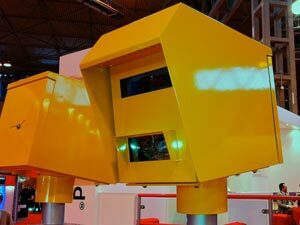 These cameras, known as SafeZone, are a new breed and apart from being rather small have the benefit of monitoring traffic over 2 lanes in both directions with a single camera. A further benefit is that the camera does not need a specific installation and can be added to existing street infrastructure such as street lamps. For more information on Siemens SafeZone click here. The Siemens SafeZone system is based around the Siemens Sicore ANPR camera this is then combined with back-office software to recognise number plates and then calculate the speed between various points in the camera network thus determining if a speeding offence has been committed. You will notice I used the term 'camera network'. This means that a number of cameras can be combined to create a web of enforcement from a single entry point to a number of exit points. 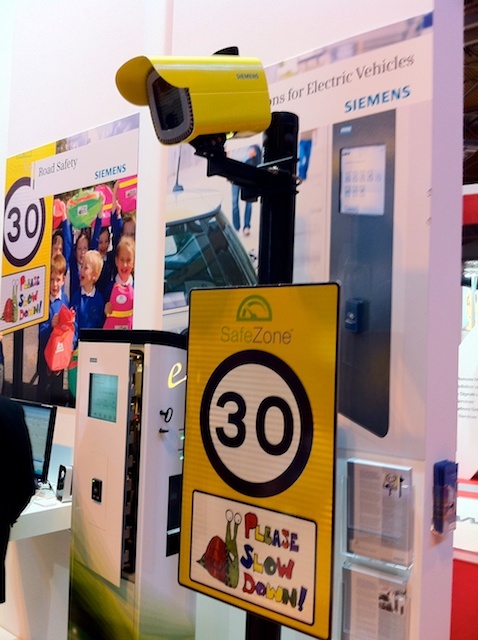 Although the Siemens SafeZone can be used on motorways the system is being marketed very much as an urban solution with particular emphasis on protecting schools. 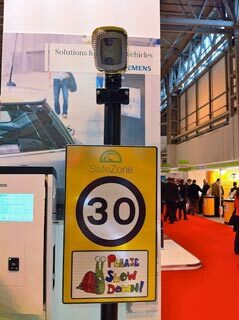 In the current economic climate where there is little available money for speed enforcement it is possible that the SafeZone system could be an answer to the cash strapped agencies. Having said that though it would mean a change of emphasis from targeting motorists on more open roads to targeting urban areas. 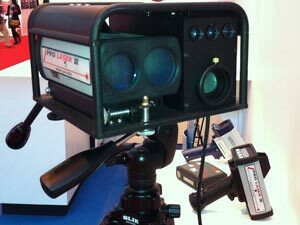 RedSpeed essentially produce 2 different type of Speed Camera: Static and Average Speed. Having said that the cameras are very configurable and the static cameras can be configured to be either Speed Cameras, Red Light Cameras or a combination of Speed and Red Light Cameras. 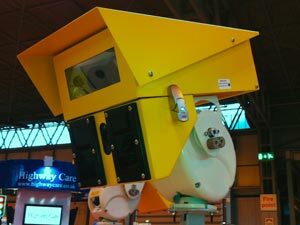 If you have been following speed camera technology for a while you may remember a device called a Monitron. This was one of the first of the new breed of digital cameras. With digital technology the need for 'wet' film processing was removed as was the requirement to visit the cameras on a regular basis to remove and replace film. The Monitron Speed Camera is now known as SpeedCurb (for speed only cameras), RedGuard (for Red Light only cameras) or RedSpeed (for a combination Red Light and speed camera). I will refer to all of these as RedSpeed. Essentially the only external difference between the camera types is the location of the speed camera. The main differences are the hardware included inside and the configuration of the camera. For all of these cameras the trigger is not done by radar, but by piezo sensors embedded in the road. These detect the vehicle and can be very lane specific. Two sets of sensors allow both the speed of the vehicle and the fact that a junction had been crossed during a red light. The RedSpeed cameras connect directly to the 'Violation Server' using the Internet. There are a number of ways it can physically connect to the Internet including 3G, WiFi, ADSL, ISDN etc. The logical connection is made using a secure Virtual Private Network. The whole of this infrastructure allows a Notice of Intention to Prosecute (NIP) to be issued with little or no human involvement cutting the cost of running to a minimum. The latest product from from RedSpeed is a HOTA average speed camera system known as RedFusion. RedFusion is promoted as a "Multi point to multi point, time over distance system". RedFusion uses ANPR (automatic Number Plate Recognition) to recognise when a vehicle passes the camera and sends the information to central servers that log the time of passing and then wait to compare it to a similar image taken from a second location. The distances between the cameras are known and the average speed is then calculated by using the distance and the elapsed time between the two points. As with the Siemens SafeZone these cameras can be constructed into a network allowing a vehicle to enter and exit at any point in the network and the average speed can be calculated. The RedFusion cameras are single units which contain two cameras, a laser trigger, and twin infrared illuminators. 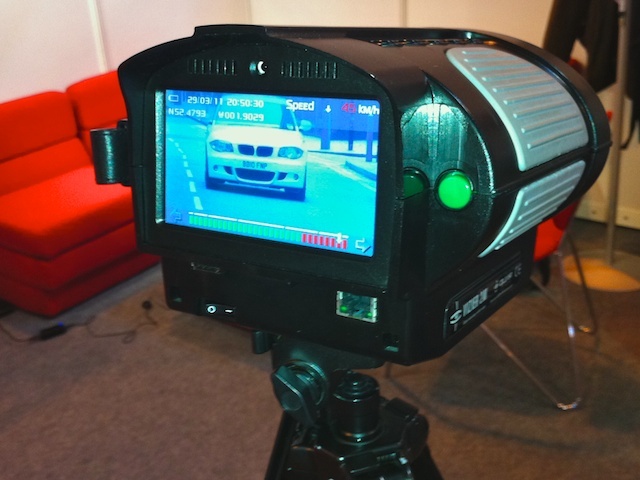 The two cameras provide a colour image of the entire vehicle whilst a monochrome camera provides a close up on the license plate. A combination of ambient light and infrared flood light enable the camera to be either forward or rear facing. 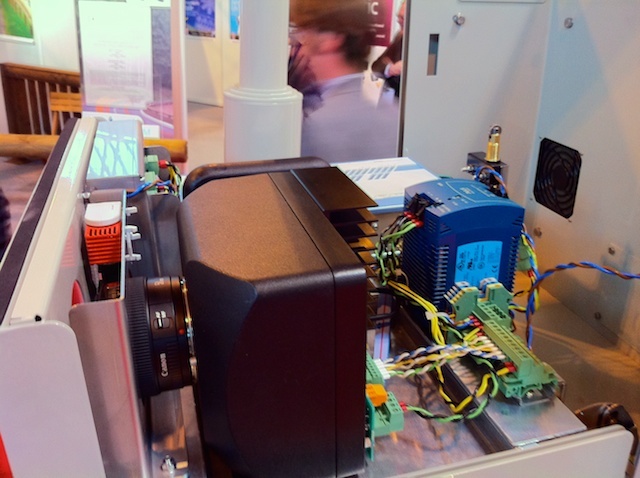 As with the Siemens system the HOTA has validated the system for detecting multiple lanes in multiple directions. The RedFusion system is currently in operation for Transport for London where 87 cameras have been installed to enforce speed limits on the A13 to the east of London. Vysionics is not a well known name it incorporates the Speed Check Services manufacturers of the original average camera system SPECS (derived from SPEed Check Services). This year there was little new to report, the SPECS 3 system we report last show has been awarded HOTA and has been implemented widely. The SPECS 3 system we originally assumed required the use of the new cameras, but I was reliably informed that any of the company's cameras can be used for the SPECS 3 networks. SPECS 3 is more about software and as long as a HOTA camera is connected in to the network then the system is capable of enforcing average speed over the entire multiple entry, multiple exit network. Vysionics did have a new product on display called the SPECS-RD with the RD standing for Rapid Deployment. 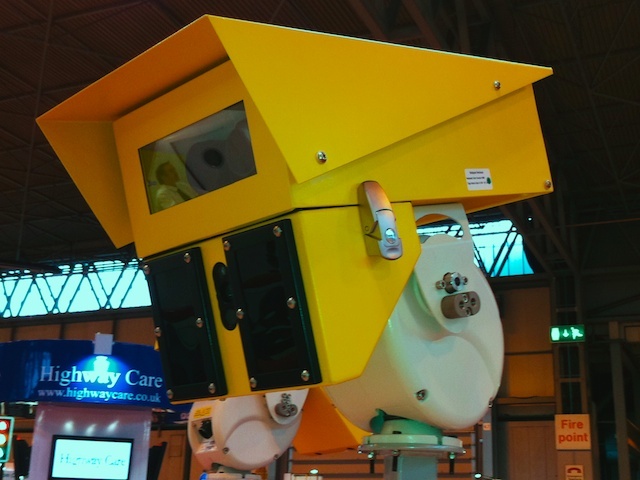 This is a self contained SPECS camera that can be rolled out, positioned and activated within minutes. 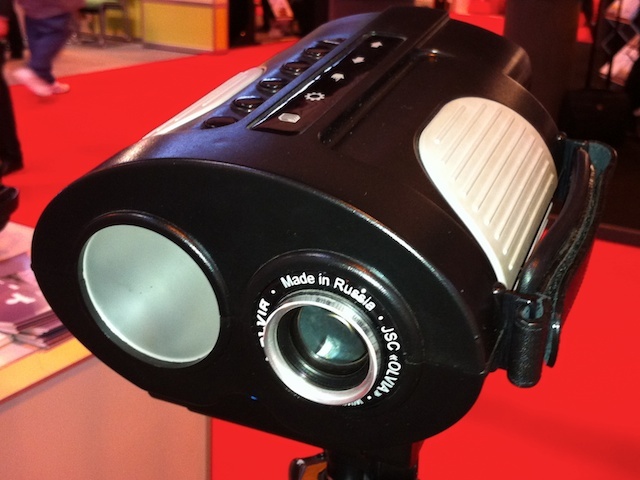 The core of the system is trailer with the camera heads mounted on a telescopic pole. The concept of SPECS-RD is to protect workers for short term roadworks where the roadworks may only be in place overnight or for a couple of days. 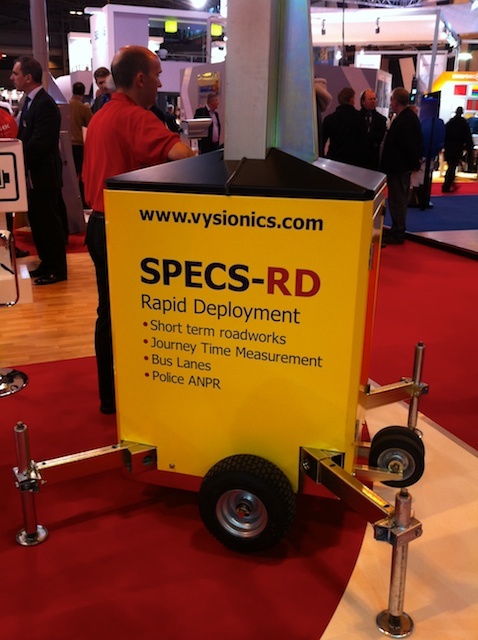 The other arm of Vysionics is ANPR systems (of which SPECS is an ANPR application). LaneCheck is a system that is capable of monitoring lanes designated for specific traffic types. This system is approved by the Vehicle Certification Agency for enforcing bus lane violations. The original Gatsometer company was showing off it's latest cameras. Interestingly on the outside they look very similar to the original Speed Cameras from years gone by. However I was lucky enough to get a glimpse inside at the internals. Gone are the wet film cameras which are replaced by some robust electronics. Interestingly you can see that this particular camera uses a Canon camera lens. There were quite a few companies demonstrating mobile speed enforcement. Truvelo were showing a number of devices, both hand held and lightweight. All have HOTA certification. 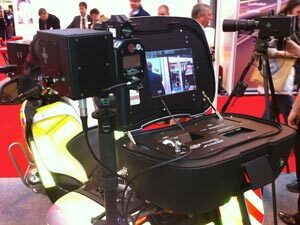 Tele-Traffic were showing their mobile solutions including both stand-alone and bike mounted systems. They use some top of the range Nikon digital lenses (which they wouldn't let me take home) which with the adapter gives an amazing magnification over some distance. The camera needs to have a steady base but the quality of the images gathered is quite astounding. A second option was to use a police bike as the entire mobile enforcement platform. Interestingly the demo bike is quite a few years old, but only has 6 miles on the clock. Finally I had a chat with Olvia a Russian company who produces the Vizier 2M mobile video enforcement camera system. This is does not have HOTA certification and will not be seen in the UK in the near future. 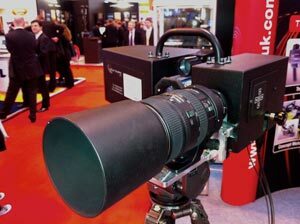 This device is a little bigger than a typical SLR camera and a lot lighter. It can be hand held and is 100% portable. The main thing with average speed cameras covering large areas is that more rsearch has to go into how they use them, the Cat and Fiddle road in Derbyshire has had them installed for a year but there are yet to be switched on because of short cut roads. Time for Satnav companies to start working on software that will show average speed from a selected start point? PS Good article - as you say, this is much more about road safety than a lot of the current arrangements. Time for Satnav companies to start working on software that will show average speed from a selected start point?. Unfortunately SatNav companies would need extremely accurate data for this to work. As an example, TomTom can't get their speed camera database accurate! However, if you own an iPhone or an Android phone then you can make use of the PocketGPSWorld's own CamerAlert App that uses the accurate PocketGPSWorld's camera database, which also shows your average speed within a SPECS zone. It's going to be a selling point!